Unit testing involves the testing of each unit or individual component of the software application. It is the first level of software testing. The aim behind unit testing is to validate unit component with its performance. A unit is a single testable part of a software system and tested during the development phase of the application software. This testing aims to test the correctness of isolated code. A unit component is an individual function or code of the application. White box testing approach used for unit testing and usually done by the developers. In a testing level hierarchy, unit testing is the first level of testing done before integration and other remaining levels of the testing. It uses modules for the testing process which reduces the dependency of waiting for Unit testing frameworks, stubs, drivers and mock objects are used for assistance in unit testing. 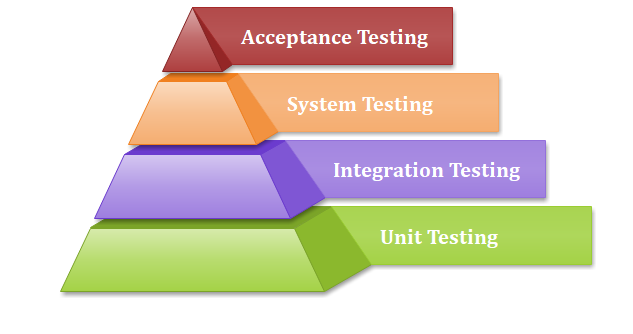 Generally, software goes under four level of testing: Unit Testing, Integration Testing, System Testing, and Acceptance Testing but sometimes due to time consumption software testers does minimal unit testing but skipping of unit testing may lead to higher defects during Integration Testing, System Testing, and Acceptance Testing or even during Beta Testing which takes place after the completion of software application. Unit testing helps tester and developers to understand the base of code that makes them able to change defect causing code quickly. Unit testing helps in the documentation. Unit testing fixes defects very early in the development phase that's why there is a possibility to occur a smaller number of defects in upcoming testing levels. It helps with code reusability by migrating code and test cases. NUnit is a unit testing framework used mainly for.Net languages. It allows scripting of test cases manually and supports data-driven test cases. JUnit is a unit testing framework used mainly for java languages. JUnit provides assertions for the identification of methods. PHPUnit unit testing tool used for PHP language. It provides assertions to use assertion methods (Methods are pre-defined) to make sure that system behaves in a required manner. Parasoft Jtest is an integrated IDE plugin Junit, Mockito, PowerMock, and Spring with easy one-click activities for scaling, creating and maintaining unit testing. EMMA is an open source unit testing tool used for java language coding. It analyzes and reports the code of java language. How to achieve the best result via Unit testing? Test cases must be independent because if there is any change or enhancement in requirement, the test cases will not be affected. Naming conventions for unit test cases must be clear and consistent. During unit testing, the identified bugs must be fixed before jump on next phase of the SDLC. Only one code should be tested at one time. Adopt test cases with the writing of the code, if not doing so, the number of execution paths will be increased. If there are changes in the code of any module, ensure the corresponding unit test is available or not for that module. Unit testing uses module approach due to that any part can be tested without waiting for completion of another part?s testing. The developing team focuses on the provided functionality of the unit and how functionality should look in unit test suits to understand the unit API. Unit testing allows the developer to refactor code after a number of days and ensure the module still working without any defect. It cannot identify integration or broad level error as it works on units of the code. In the unit testing, evaluation of all execution paths is not possible, so unit testing is not able to catch each and every error in a program. It is best suitable for conjunction with other testing activities.